I seem to be surrounded with puppies. 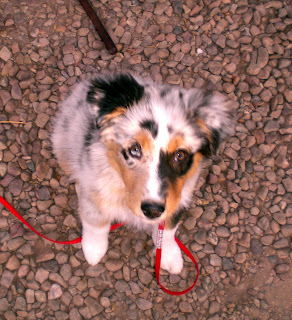 My agility friend, Terri, has a new Australian Shepherd named Chase. 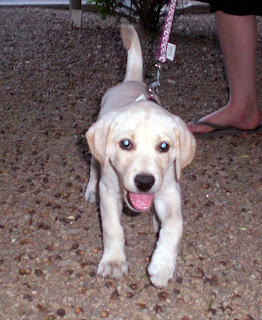 My friend, Nico le, just acquired Violet, the world's cutest lab puppy. And my book club buddy has been blessed with Buckley the Border Terrier. I have no photo of Buckley because when I visited him it was late at night and in my tiredness it never occurred to me to get out my camera. I'll post his photo as soon as I get it. Rest assured he is every bit as cute as Chase and Violet. What is even cuter than Violet are the fat cankles in the background! UGH! Mariah Carey - What a Wacko! What Do You Want To Be AFTER You Grow Up? How Did Tomorrow Do Last Night? Applications are posted for The Amazing Race! How about some will power? Um, no thanks. Maybe today won't be so good.